We're still well off the minimum order quantity of 15 items at Endura, so I've gone ahead and sent my spare jersey and the Endura artwork to Impsport for them to copy and colour match. This makes things a lot easier for me. I don't have to worry about whether people are going to pay for stuff they've ordered or if stuff I have posted is going to arrive. Once it's all designed and I've approved it, they will set up a club shop on http://www.impsport.com/ and anyone can order any item direct from them. There's currently about a four week lead time on custom print orders. The only change I have asked them to make to the design is to move the writing on the short sleeves up by about 20mm. I find the hem bunches up a bit and makes it hard to read. Has anyone got any other suggestions for minor changes or improvements ? I've got the design back from Impsport. I've got to phone them back on Monday to get the long sleeves changed as the white lettering should be on a green stripe. I also thought about getting the writing on the short sleeves turned 90 degrees to run up or down the sleeve instead of around the cuff. 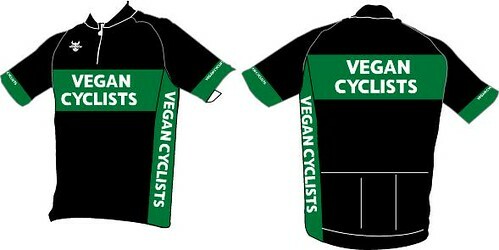 I did wonder about getting the writing on the sleeves changed to GO VEGAN as well. What do other people think ? 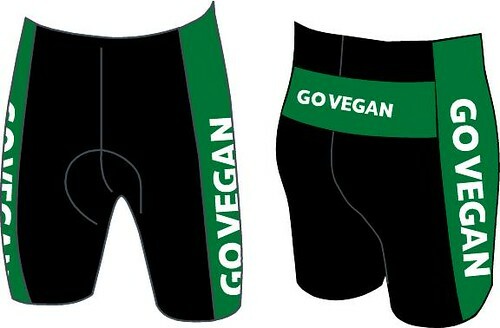 Keep it as VEGAN CYCLISTS on the jersey and GO VEGAN on the shorts, or mix it up a bit ? 3D views of the design as it is now. Those long black sleeves definitely don't look right and I reckon the short sleeves would be better with the writing bigger and aligned with the sleeve. If I had mote spare cash I'd be buying a lot more of this stuff right now! 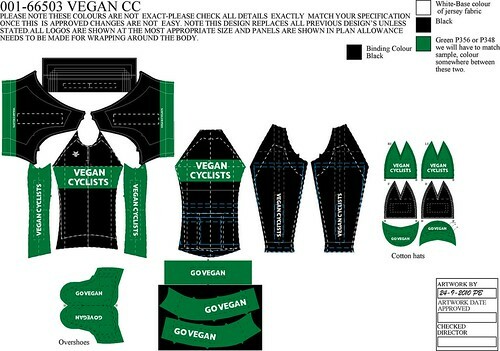 We use Impsport for the Vegetarian Cycling & AC club kit and while I don't personally have a pair of club shorts I suspect someone would have kicked up by now if the pads were real chamois leather. The synthetic chamois is much more common in shorts now (when they don't use 'gel inserts'), it looks similar but is cheaper and more durable than stealing it off a mountain sheep (goat? antelope?). Just possibly some of the 'it's got to be real leather' Brooks saddle fetishists still provide a market for the skin of these beautiful creatures. My team uses Imp Sport too, and its definitely a synthetic insert. Leather hasn't really be used for years now. Too expensive and too much trouble. really like the jerseys! nice work. A year later and I've finally got around to chasing this up. Click on "Your Club Shop" then put the code VEGC1234 in the box to get in. There's no pictures at the moment. They use pictures of real garments and everything is made to order, so until someone orders something and they make it, there's nothing for them to take a picture of. If you click on the "Clubs" box on the left, there are a few open clubs where you don't need a password, so you can get an idea of what to expect. Those are the prices you pay. You're dealing with the shop directly, I get no commission, so can't offer a discount. The Endura stuff from the first time round is still available, but there's a minimum order of 15 items. By using Impsport this time it makes it easier for me as everyone can just order what they want directly. Just ordered myself a lightweight jacket. 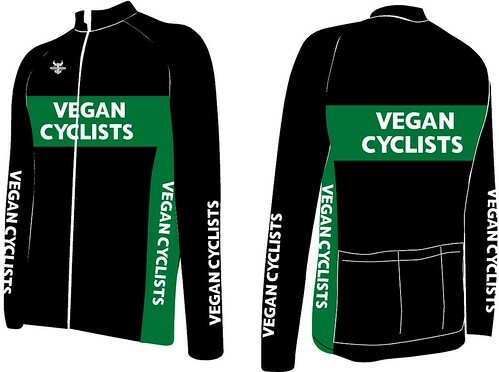 I found it useful to put 'jacket' in the Impsport search thingy so I could look at some pictures, albeit not in the Vegan Cyclist design. Almost got caught out on the postage, it's free for orders over £60 but you have to select the option on the 'basket' screen or it charges you £5 by default (a trick I guess they learnt from Wiggle). That's good news about the postage. I can't see it on the delivery page, does it only come up when you actually order something ? [quote="Big Good Wolf"]That's good news about the postage. I can't see it on the delivery page, does it only come up when you actually order something ? Yes it's on the drop-down postal options menu when you're at the checkout stage after you've ordered (but before you've committed I think) - I wouldn't have spotted it if I hadn't clicked the menu, they seem to keep it quiet.